Tim Thomas places a tip-up on the ice. UPDATE 3/7/13: Edited to correct the cost of a NYS fishing license. "C'mon! It's OK — you won't fall through." The man in the green-and-brown hunting jacket and snow pants gestured for me to follow him onto the ice-covered pond. The last part of what he said made me pause. Why would he say something like that? 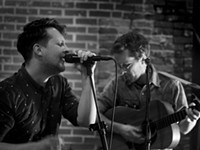 But the knowing look in his eye, and the assurance in his voice, melted away my doubts. And so I stepped, cautiously, onto the ice. We crossed the pond — sans boat, raft, or doggy paddle — toward two figures dressed in black and yellow snowsuits. They were easy to spot across the vast, white tundra punctuated only by a few tents atop the ice. As we got closer, the skeleton masks over their faces came into sharper view, sending another frozen shockwave up my neck. But that quickly vanished as Tim Thomas bellowed out a hearty, "Hey there!" The strong handshake and pat on the back reassured me that today, I was not only among friendly ice fishermen. Today I actually was one of the ice fishermen in the Victory Baptist Church's ice-fishing derby. And by the end of that day, I'd have the frostbitten toes and fingers — and a 14" northern pike — to prove it. Brothers Jeff and Tim Thomas (left to right) fish at Mendon Ponds Park. Rochester is obviously known for its icy cold winters. 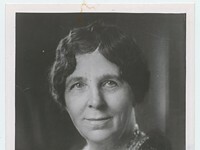 But few would guess that, according to the New York State Department of Environmental Conservation, the Greater Rochester area is home to roughly 2000 sportsmen willing to trek out on frozen ponds, cut through the surface ice, and try to catch a fish on just about any pond or body of water that freezes over between December and March. 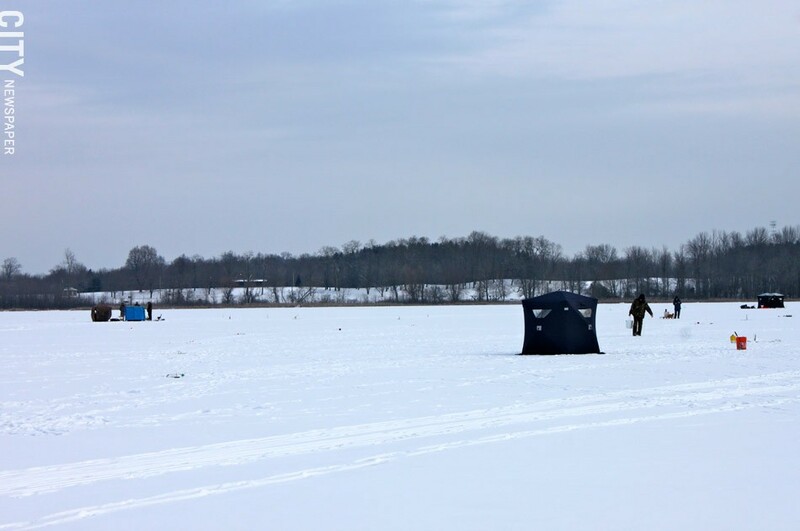 On a good weekend, if conditions are right, you can easily find anywhere from 100 to 200 ice fishermen just on Sodus Bay — and just about as many on the next waterway and the next after that. For some, it's a way to keep occupied during those long winter months, to get away from the noise and flurry of everyday life. For others, it's a chance to compete against other anglers and experience the adrenaline that comes with it. 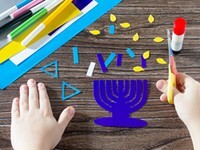 And for others still, it's a tradition, something passed onto them from their parents, something that's in their blood. "We were fishing pretty much from the time we were potty trained," says Jeff Thomas, a local ice fisherman. He and his brother, Tim, learned to fish from their father when they were just 8 or 9 years old. The brothers are now in their mid-30s, with families of their own to pass along their fishing skills and know-how. "It started out as a hobby, just something to do, to get us outdoors. 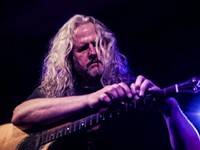 And for my brother and I, now it's become a passion," Tim Thomas says. The pair is now trying to spread that passion to anyone who wants to give ice fishing a try. 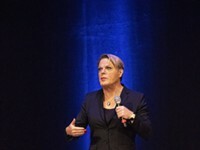 The sport has grown steadily both nationally and locally, thanks in part to ever-advancing technology. 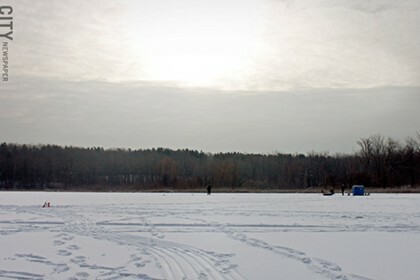 Ice fishing was born, like many activities that have become modern-day hobbies, out of necessity. Native Americans would carve holes in sheets of ice with primitive axes, and use a spear to catch fish in order to survive the winter months. 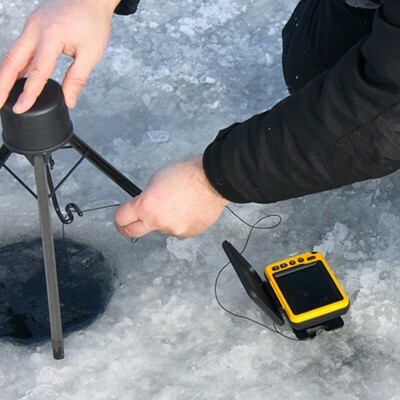 Over time, ice fishermen traded spears for hooks on fishing lines and those axes for ice augers, and now there are even underwater cameras wintertime anglers can use to check out the action below the ice. 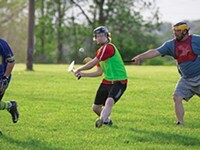 But while some of the equipment has evolved, many of the original ideas and principles of the sport remain the same. The most common pieces of modern ice-fishing equipment are jigging rods and tip-ups. Most people who have been fishing on ponds, lakes, and other bodies of water would recognize the jigging rod, which looks like a typical open-water fishing pole, just a little smaller (anywhere from 18" to 3'). Typically, anglers use a small piece of bait, like worms or minnows, in addition to lures on jigging rods to catch fish like sunfish, yellow and white perch, and blue gills, which are active in the winter. Anglers jerk the rod to make the bait dance, attracting fish. Tip-ups consist of a wood or plastic frame with a cross-shaped base, a spool of fishing line, and a thin piece of metal that goes between the spool and a flag. When a fish goes for the bait, it triggers the flag, sending it up in the air and signaling the fisherman that he's got something on the line. Unlike jigging rods, once a fish is hooked through a tip-up, anglers will use their hands to pull up the line rather than a reel to drag the fish to the surface. "Those are our newest toys," says Tim Thomas. In the past two years, the Thomas brothers have turned pro, getting sponsorships from several fishing-gear companies. It means they get to test out the newest products on the market. 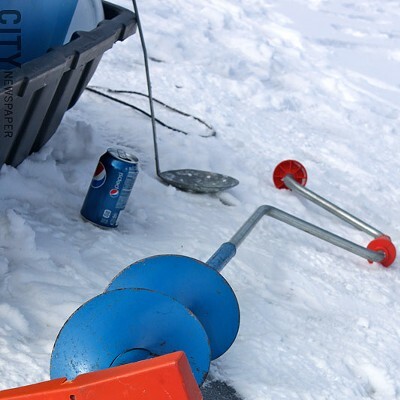 Most modern-day winter fishermen use ice augers, which are large metal poles with a spiral blade attached to the bottom. And while it still involves manual labor, "It's a hell of a lot easier than back in the day," Tim Thomas says. And if you're willing to spend the big bucks, there are battery-, gas-, and propane-powered augers. Those do all the work for you, but they're a lot heavier and clunkier than manual augers. 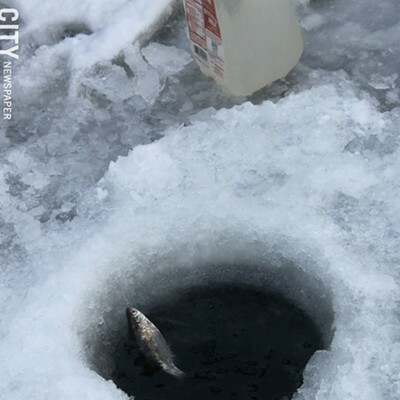 You can ice fish pretty much anywhere that freezes over during the winter. That's good news for area fishermen, since Rochester is surrounded by water. 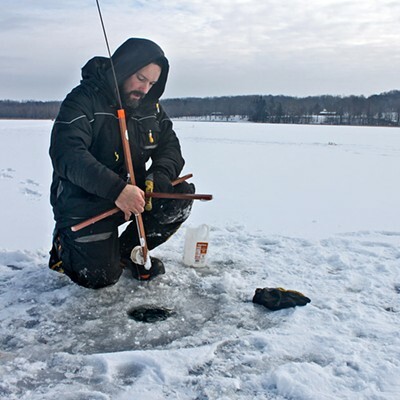 Places where ice fishermen tend to flock include Mendon Ponds Park, Braddock Bay, Irondequoit Bay, Sodus Bay, and some of the Finger Lakes ("Some of them don't freeze over because they're so deep," says Tim Thomas). Depending on what kind of fish they're going after and what body of water they're on, fishermen lower their lures and bait down at different depths. While some fish stick close to the bottom of a water body, others swim right underneath the ice. Around here, most anglers target bigger fish like northern pike, walleye, rock bass, and smaller panfish. And since each fish has its own habits, each angler tailors his or her skills accordingly to outsmart the fish. "We've tried to go after perch with our pike tactics and it doesn't work," Tim Thomas says. "Every species has its own little quirks, their own little things that you have to know about and perfect in order to catch them." Among those things is daylight. Most ice fishermen head out early in the morning when it's still dark out. "When the sun comes up, the fish almost get spooked," Tim Thomas says. He adds that cloudy weather can make the fish more inclined to bite. "There are a lot of it is tricks you just have to learn throughout the course of your fishing career," says local angler Jim Redding. "There's really no science to it." He's been ice fishing for the past five winters, using his father's old tip-ups. He says he's been relatively successful, catching several northern pike and more panfish than he can remember. But, "it's hit and miss a lot of the time. If I had it down, I'd go pro," he says. For Redding, it's less about how successful he is at catching fish, and more about spending time with his son, Rick, and 7-year-old granddaughter Aliyah. This is Aliyah's second full season on the ice. "So long as we can keep her warm, we stay out," he says. "When she gets cold, it's time to go home." Aliyah spends most of her time in the family's shanty, a small tent pitched on the ice to protect fishermen from the wind. But the second someone shouts "flag up!" she's bolting across the ice to see what she's caught. "I may be a girl, but I fish better than a boy," Aliyah says. And she did just that at the Victory Baptist Church Sportsmen's tournament on January 26, catching the second-biggest fish (for the record, her catch was 4 lbs., 2 oz., and 28" long). Ice fishermen shanties at Mendon Ponds Park. Weather adds another layer of variables to the sport. How cold it gets — and how long it stays that way — can make the difference between a stellar ice-fishing season and a crapshoot. Locally, the winters have been inconsistent over the past few seasons. Last year, Tim Thomas says, was one of the worst seasons he could remember. "We barely got out at all," he says. But just a year or two before that, the December chill came in early and stuck around through March, keeping the ice in great shape for ice fishing. It doesn't take much to build up enough ice on local waterways for it to be safe to fish. 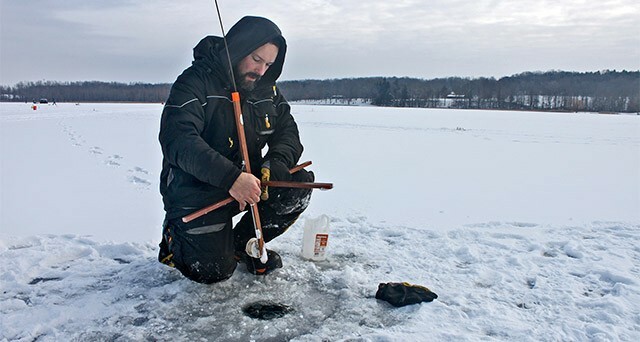 According to state Department of Environmental Conservation recommendations, ice fishermen should wait until there is a minimum of 2" to 3" of black ice or 4" to 6" of white ice before venturing out with their equipment. But if temperatures yo-yo, which is often the case in Rochester, it can pose a problem. "Typically if you have temperatures in the teens and single digits, you're going to be building 1" to 2" of ice per 24-hour period that it stays that cold," says Tim Thomas. 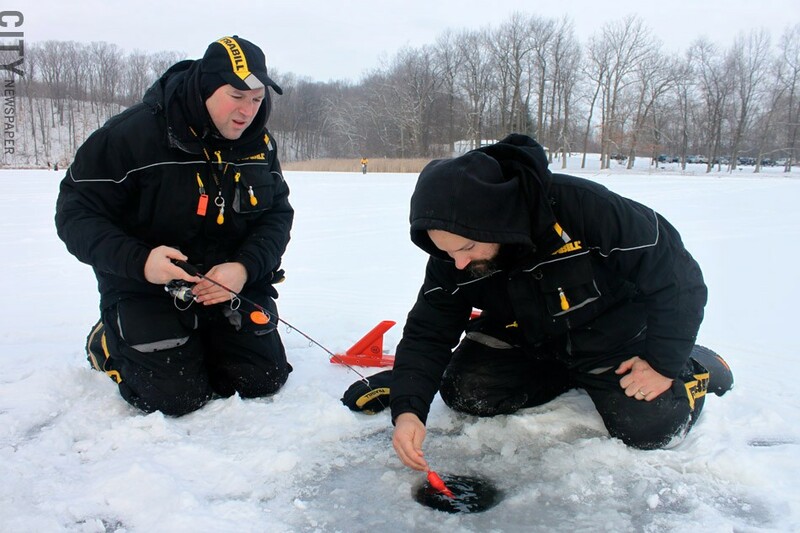 In ice-fishing, "black ice" has nothing to do with the hard-to-see slick spots on roadways. Black ice is clearer, and sturdier. It's the kind of stuff ice fisherman want to see. "It's very hard, extremely dense, and can support a lot of weight with very little ice," Tim says. About 1" of black ice is comparable to about 3" to 4" of "white ice" or "snow ice," according to the state DEC. White ice is less dense and has a higher water content, so it takes more of it to support greater weight. "That's where a lot of people get the misconception. They think, 'Oh, there's 2.5" of ice, we're fine,'" says Tim Thomas. "But in reality, if it's white ice, that can be dangerous." The heavier the equipment you carry with you, the more ice you'll need to support it. Plan on using a four-wheeler to lug some of your gear? Make sure there's at least 5" or 6" of solid black ice. Add another 2" to 3" if you want to use a snowmobile. And though it's physically possible to bring a car out onto the ice, Rochester's waters typically don't freeze deep enough to support that much weight, so state officials (and most of the fishermen I talked to) recommend that you leave your ride on shore. Also note that conditions can quickly change from safe to dangerous. 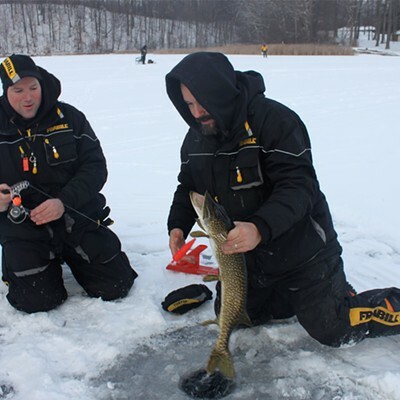 Once this season Tim and Jeff Thomas were out on the ice with several other anglers, all crowded around a high-tech device called a flasher (it sends a signal, like sonar, through the water to show fishermen how close the fish are). "All of a sudden, there was 4" of water on top of the ice because of all the weight of us; the snow ice that was there was starting to cave in," Tim Thomas says. "It just goes to show you... I mean, we had a good 4" of ice, but if it's not the right kind and you get too much weight in one place, you can get into trouble." While ice and snow go hand and hand for most of us, the latter is Kryptonite for ice fishermen. "As ice gets buried in snow, that snow acts like a blanket and insulator, and it diminishes the ice's ability to form and its strength drastically," Tim Thomas says. Other potential problems are underwater currents and springs that can thin the ice in places. "You don't always know what's happening underneath the ice," he says. Redding tends to venture out onto smaller waterways like the ones at Mendon Ponds Park and Cranberry Pond rather than the bigger ones. He says the ice on Sodus and Irondequoit bays is generally too inconsistent for him to risk it. "You can have 6" to 7" of ice in one spot and then 200 yards away, it'll be open water," he says. "That to me is just taboo." Still, every year Redding and Tim Thomas say, someone falls through the ice. "They're too eager to get out there, so they risk it," Tim says. 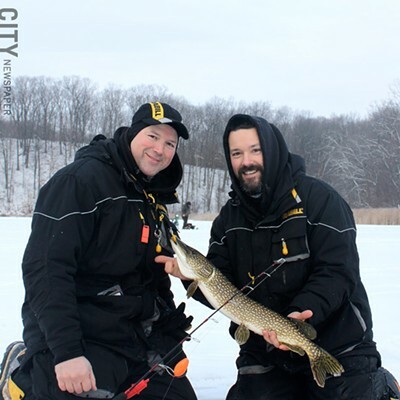 That's why Matt Lochner, an avid ice fisherman who also works as a lieutenant for the Monroe County and Wayne County sheriff's departments, says better safe than sorry. "It's not worth putting yourself in danger," Lochner says. "We're equipped and trained to handle water rescues, but we never want to have to use those skills." "I have — knock on wood — never fallen in," says Tim Thomas. Neither has his brother, nor any other angler I came upon. But they've all heard stories about that sort of thing happening so they make sure they are prepared. The Thomas brothers not only carry a 25-foot-long rope, but they also carry ice picks, which are handles with a 1" metal spike on them. They clip onto your jacket or you can keep them in your pocket, so in case you do fall through, you have something the dig into the ice to get yourself back out. 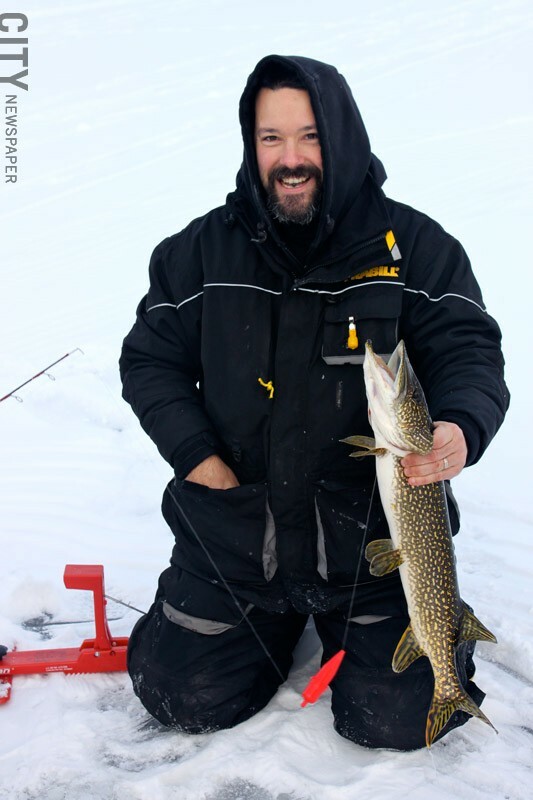 What you wear ice fishing is almost — if not more — important than what you bring on the ice with you. I found that out the hard way. My standard snow boots, snow pants, parka, gloves, and my dorky hat with earflaps were no match for the long hours out on the ice. While the seasoned anglers didn't even seem to notice the frigid temperatures, I had lost all sensation in my fingers, feet, and face after about an hour. Those guys are tough — but they're also outfitted for it. Wool socks, long johns, pants, sweatshirts (yes, plural), and full snowsuits were all being used. The best way to keep yourself warm, aside from bundling up, is to use a shanty, or small tent. Shanties range from small one-man getups to fully pimped-out eight-person huts. "You could have a serious party going on in one of those — a big mirror ball going 'round the top," say Tim Thomas. In all seriousness, even the smallest refuge from the wind and the cold can make a difference. "Let's face it, though — the weather's just nicer in the spring and summer," says Jeff Thomas. Still, there are thousands of anglers across the state willing to brave the frigid temperatures for bragging rights, and if there's the option, some prizes. That's why the Thomas brothers started the first New York State Ice Pro-Am Tournament series this year. 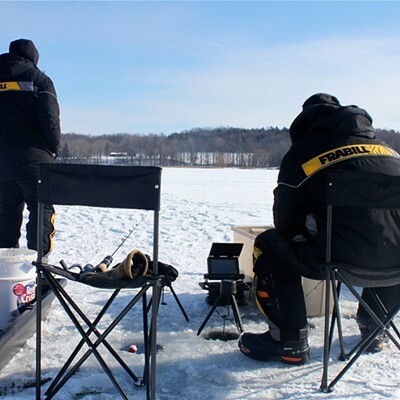 The tournament included events at Chatauqua Lake earlier this month, Sodus Bay last weekend, and one more on March 7-8 on Tupper Lake in the Adirondacks. Tim Thomas with his catch. If you want to get into ice fishing, head to nearly any sporting goods store and be ready to drop about $75 to $100 on basic equipment and bait. Once you've got the equipment, though, the cost levels off to about $15 to $30 a trip when you factor in gas and travel costs. Jigging rods (about $5 to $15 for the rod and another buck or two for the jigs or lures) or tip-ups are your cheapest option, running about $10 to $30. Automatic fishermen run about $70 to $80 per set. You also need a license to fish. A year-long license for New York state residents costs $29 ($5 for seniors 70 years or older), or more for serious sportsmen. For information on how to get your license, visit dec.ny.gov. And take a buddy with you — preferably someone who's got some know-how. A quick online search will turn up dozens of local sportsman clubs, often called "rod and gun" clubs. For another easy way to track local anglers, visit iceshanty.com. The online forum and message board system covers the nation, but plug your location into the search bar and there's no shortage of anglers ready to take the bait and take you out to try your hand at ice fishing. I found that out first-hand at the Victory Baptist Church Sportsmen's Ice Fishing Derby, when some of the anglers I was interviewing suddenly handed me the fishing line and egged me on. I started to pull on the line, but it didn't seem like I was reeling in anything. Then, a swift jerk on the other end. "Oh! 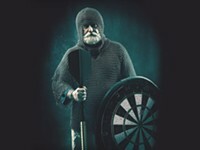 There he is!" The other fisherman coached me along. "If he wants to go, let him go a little bit." After about a 30-second dance of pulling and waiting, waiting a bit more, then pulling again, I could see the head of the fish just below the water's surface through the small hole in the ice. I shrieked, but everyone else was clapping and cheering me on. "Now you gotta hold it for the picture," the fisherman said. I'll admit, I was a bit squeamish about a) taking my gloves off in the frigid temperatures, and b) holding the still living, wriggling fish with my bare hands. But soon, a small crowd had gathered to see what came out of the ice. So, with a little coaching from Tim Thomas, I picked the fish up just behind the gills and showed it off. After it was weighed and measured (I didn't even come close to placing in the tournament), I gently slipped him back through the hole in the ice. The experience heightened my respect for the people who tackle this sport for fun. The camaraderie, that sense of respect for fellow anglers, and that willingness to teach someone new is part of the thrill of ice fishing. "We've got to keep people excited about ice fishing," Tim Thomas says. "Most ice anglers learned from their parents or friends, so if we can keep that momentum going, we can keep the sport going and growing."